Home > Hallmark Ornaments By Year > 2010 Hallmark Ornaments > View All 2010 Hallmark Ornaments > 2010 Merry Mixer - bowl turns! 2010 Merry Mixer - bowl turns! 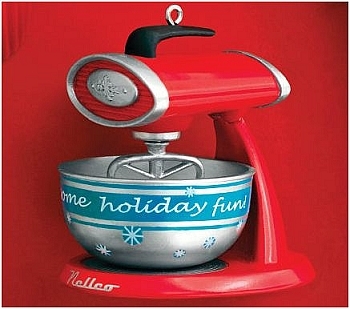 This 2010 Hallmark Keepsake Ornament features another "Nellco" appliance! The mixing bowl turns. On bowl: "Mixing up some holiday fun"
* Ornament includes a small molded copyright date on the bottom of the ornament. This ornament is not noticably dated.